God, I want a baby. And I haven't told You that for a while now. In my grief, I packed the request in a safe space in my heart where I knew He could see it but I couldn't. His light can shine on it, but mine won't. In my fake-surrendering (you know the kind, where you "lay it down" and then actually don't? I do it all the time! ), I pretended I've asked persistently - without ceasing, continuously knocking, continuously seeking. But I haven't. I've given up a little bit of ground and authority because my infertility has kept me pretty safe. I know how to navigate being a two-person family. I know how to keep this routine, even when our routines shift. I know exactly how to handle most of the situations that come our way. I thrive in the day-to-day, feeling at home with myself, by myself, and carefully crafting my tribe that I allow in. I know at certain times of the day, there is no one actually dependent on me for a meal or safe keeping. I can, within reason, do what I want, when I want. Don't want to wake up at 6am today? I don't have to. Want to go grocery shopping at 7am? I can - and there are NO crowds, but a long Starbucks line, in case you were wondering. Point is, infertility has created a bubble for me. Sometimes it's uncomfortable, but for the most part, I know exactly what it looks like. "Because you won't ask Me for one anymore. Do you still want a baby?" 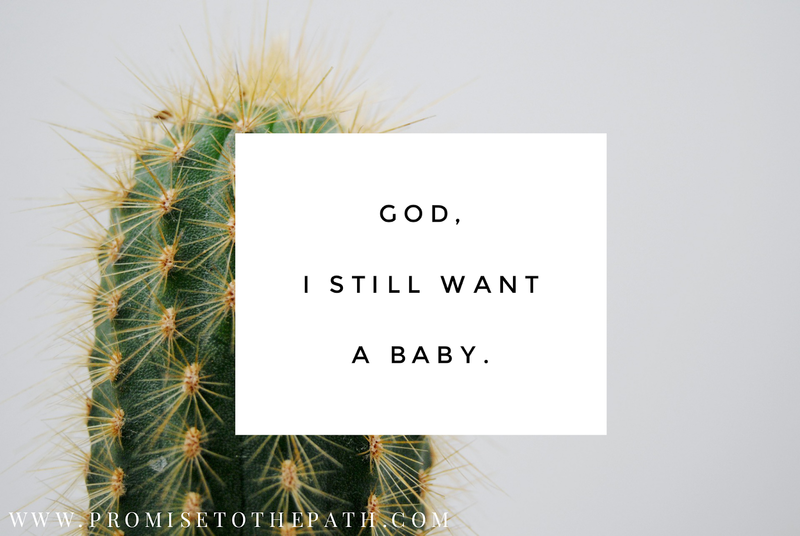 Apparently when you allow a desire as strong as motherhood to change your entire identity and self (for me it's launched me to see my identity in Christ, as a daughter, not for my reproductive skills or lack thereof), you get a little focused on the fruits of infertility. 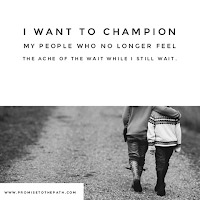 This isn't a bad thing - the fruits from this journey have been a major overhaul of my entire person, a deeper and dependent relationship with Jesus, a shifted perspective, a strong and powerful marriage, beautiful friendships, opportunities to walk with others in their own journey (infertility or not) with a different outlook - really beautiful things have happened through this. It's just too easy to get focused on being fruitful here and forget why I'm here: a promise God spoke to my heart that He wants to hear me repeat back to Him. Jeremiah 29:12-13 In those days when you pray, I will listen. If you look for me wholeheartedly, you will find me. What a beautiful promise God wants our hearts to truly believe: He will listen. Even if you've cried it out three million times, or laid it at His feet and picked it right back up again. Whether you've walked away from your faith or you pray every single day - we are to pray about all things, right? So when God asked me if I still wanted a baby, it wasn't to dangle the carrot or heap shame on my heart, it was like Jesus asking Peter - Peter, do you love Me? -- to remind Peter of his love for Jesus, and to remind my heart that not only do I still want a baby, but that He will hear my prayer for my child. So maybe there's a desire or a dream that you have nestled into your heart, but because the promise hasn't shown up yet, you've let go of the hope or will to pray for. Get still and close enough that you, too, can hear God whisper "do you still want that?". Maybe it's right around the corner, and God is so excited to surprise us with the blessings He has for us, that He wants us to get excited, too.